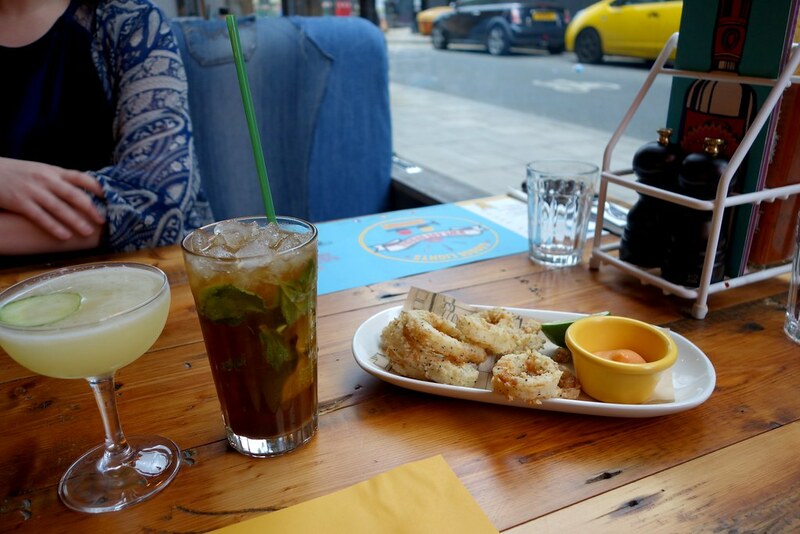 Last weekend I pretended it was still summer, and headed down to Cabana Brixton with one of my favourite people. 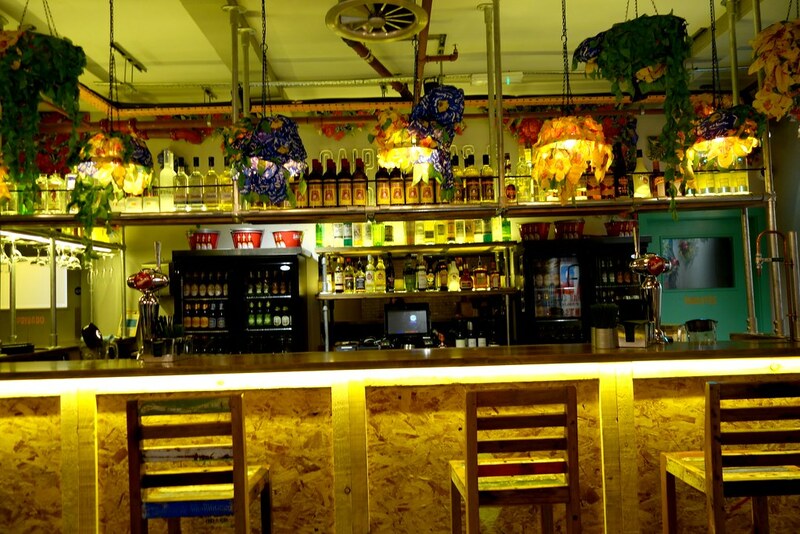 Cabana specialises in Brasilian barbecue during the day, and becomes a lively caipirinha bar at night. 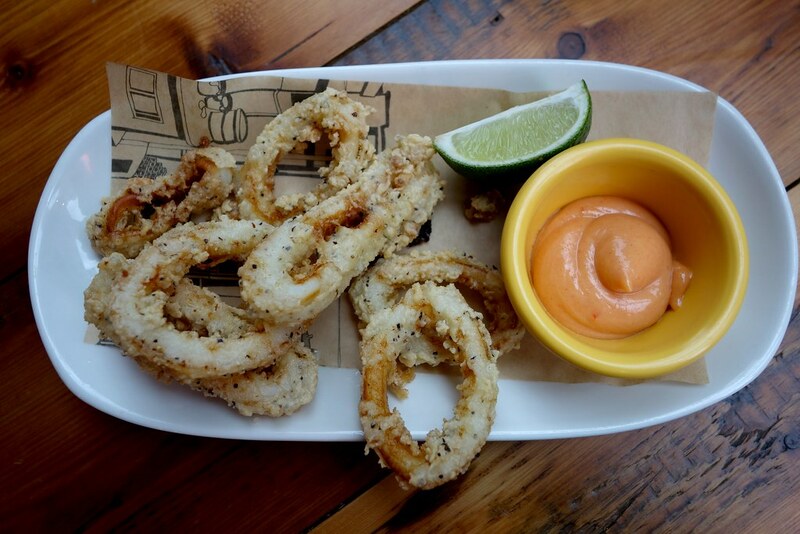 Great food and delicious cocktails? I was all over it. 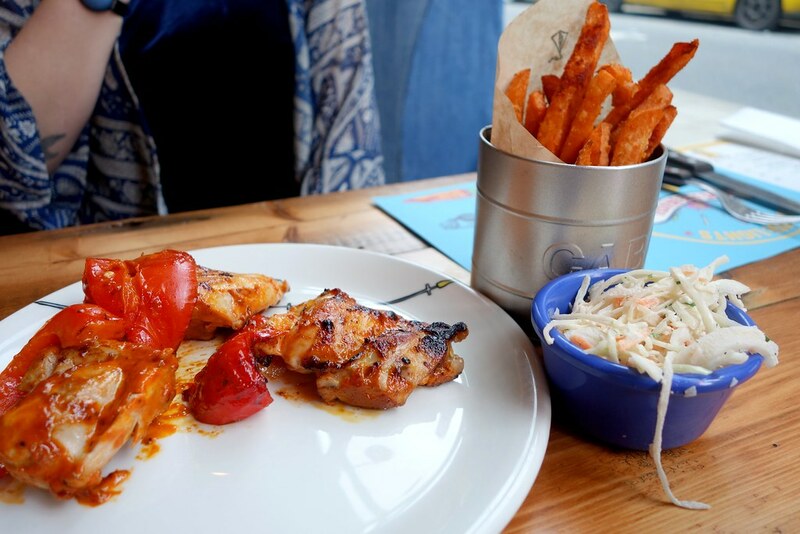 One of the things I loved most about Cabana was the attention to detail – everything was vibrant, colourful, and fun. We started off with a couple of cocktails, my favourite being Carlos the Godfather – a mix of gin, elderflower, lemon and lime. 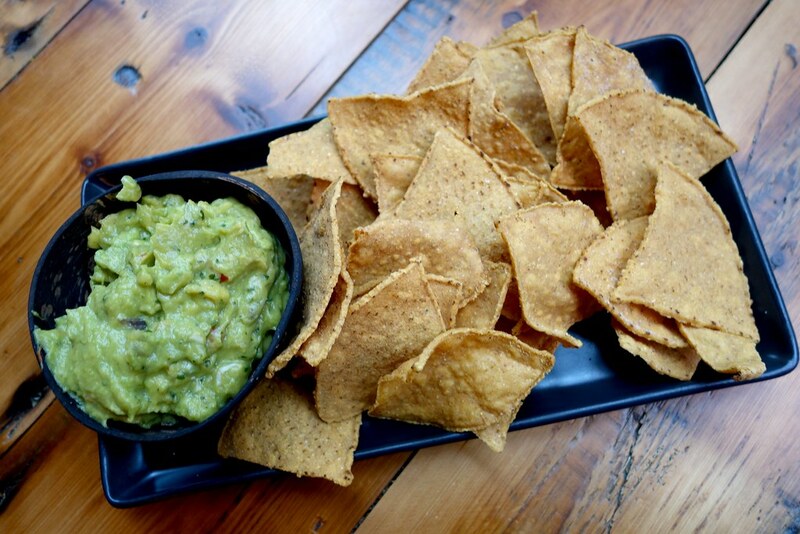 It went surprisingly well with our starter, the guaca-molho (guacamole, served with corn tortilla chips) and crispy squid. 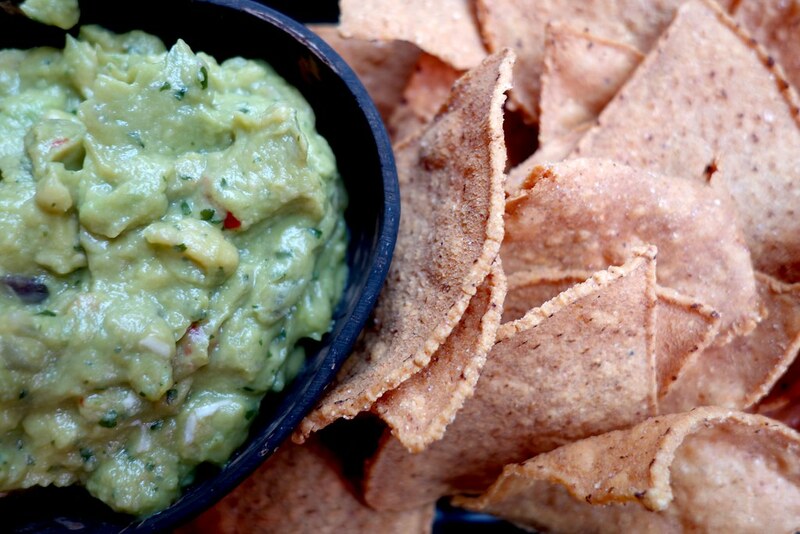 Although the guacamole wasn’t as chunky as I like it, it was clearly made fresh, and was really delicious. 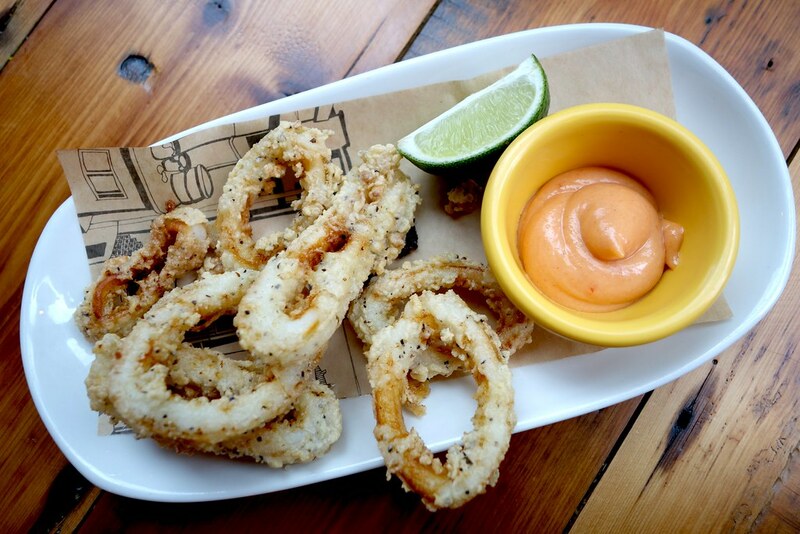 The squid crispy and light, and I loved the malagueta mayo dipping sauce, too. 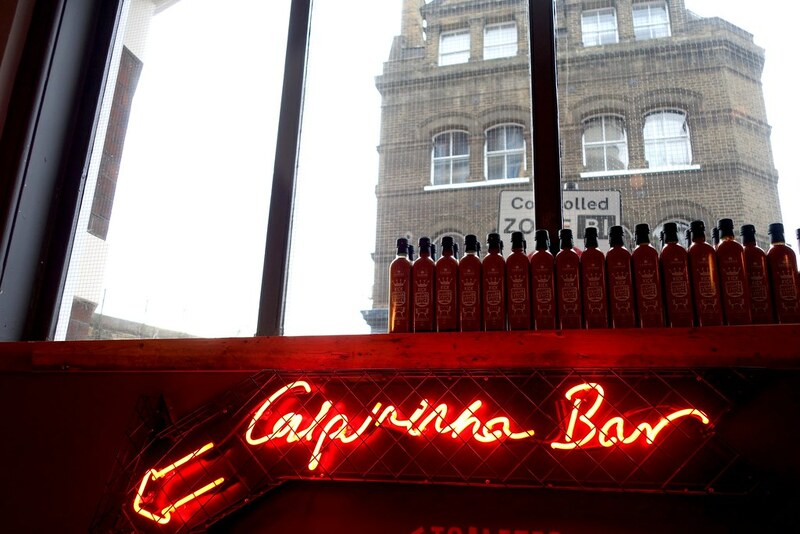 One of the things I really liked about Cabana was the commitment to local and Brasilian causes. 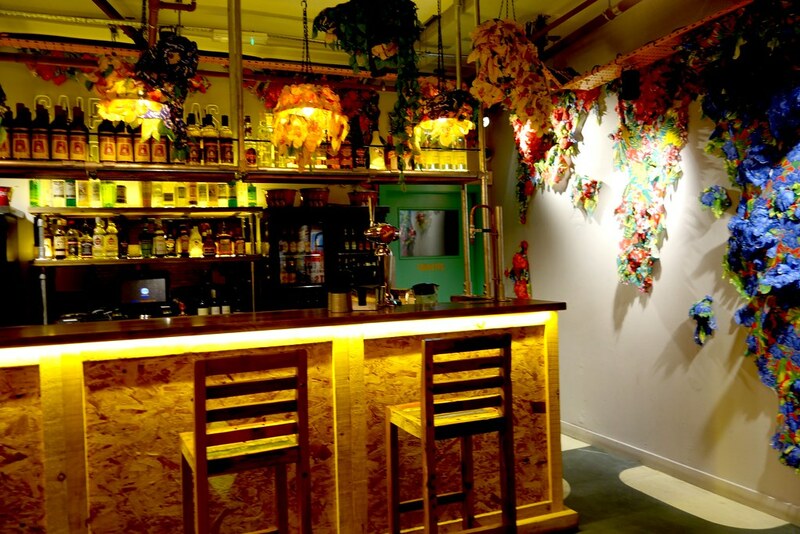 A lot of the eclectic decor was upcycled and sourced locally from a Brixton charity, the Remakery. 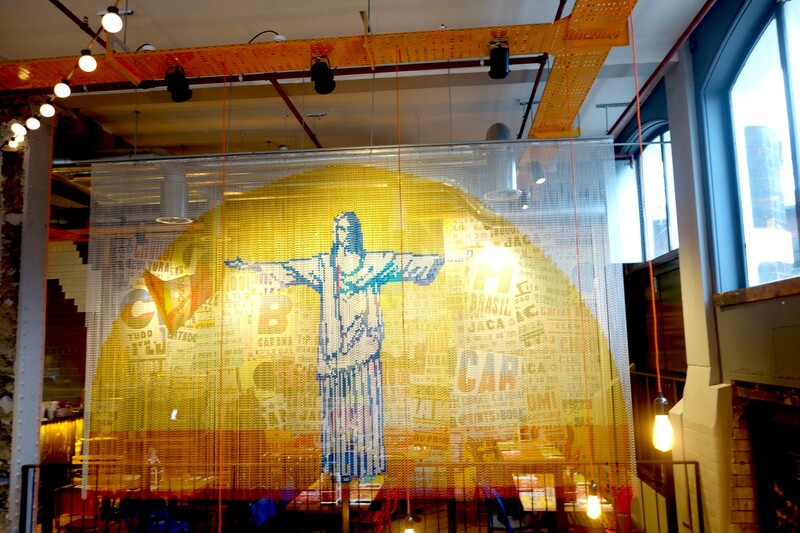 The denim seats was also upcycled, sourced by Recicla – a Brasilian charity based in the Rio favelas. The proceeds also help build and run local schools there. 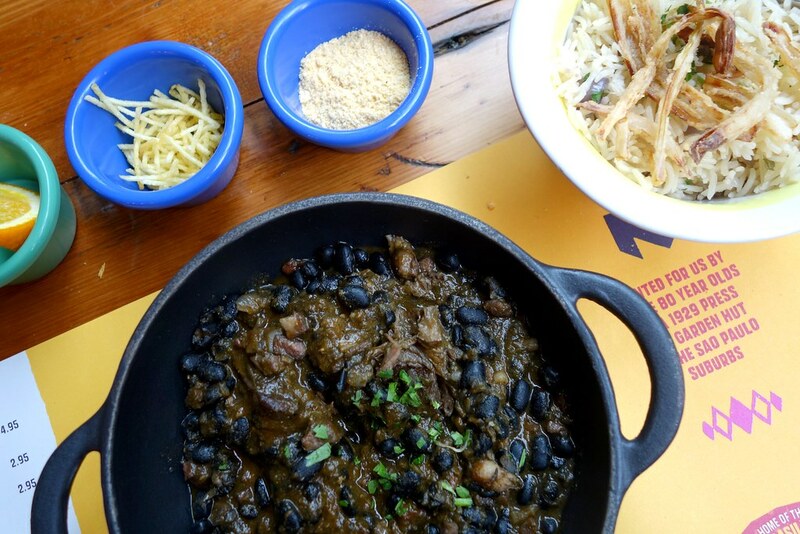 For my main course I went for the Feijoada, which was something I hadn’t tried before. 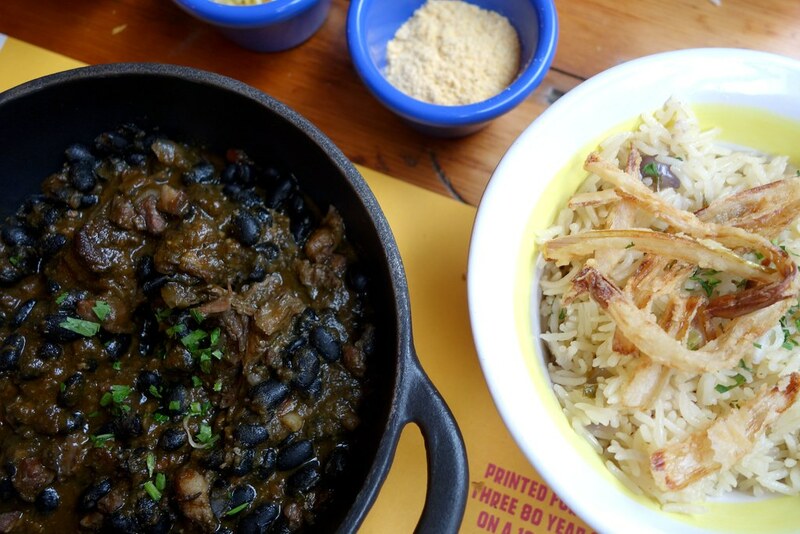 The Feijoada was their version of the Brasilian national dish, a slowcooked mixture of beef, pork, and beans, served with rice. 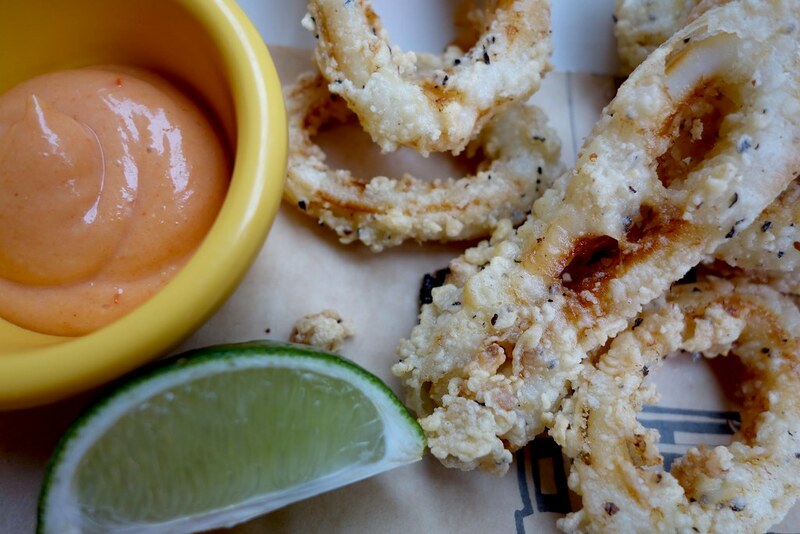 It was served with some interesting sauces and toppings, too – some that were basically crisps. 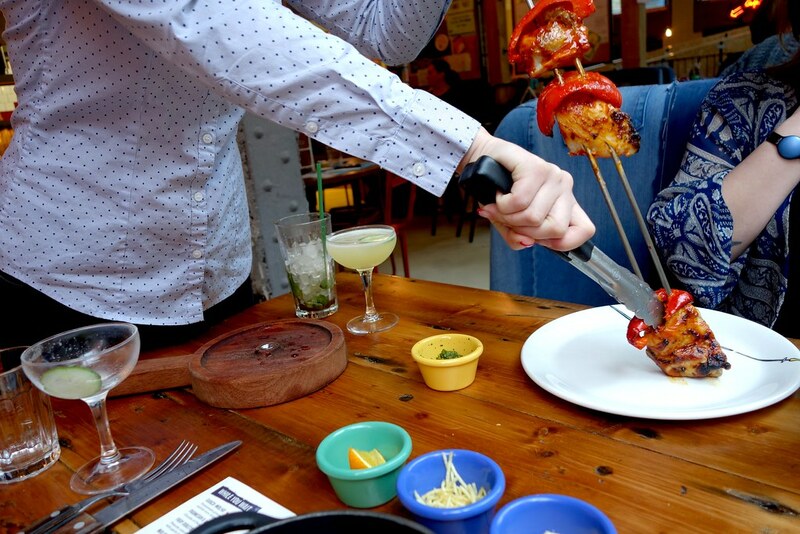 My lovely lunch date went for the chicken malagueta skewers, which were perhaps the more exciting choice – sizzling hot skewers served directly onto your plate are always going to be a little more dazzling than a hot pan of beans! 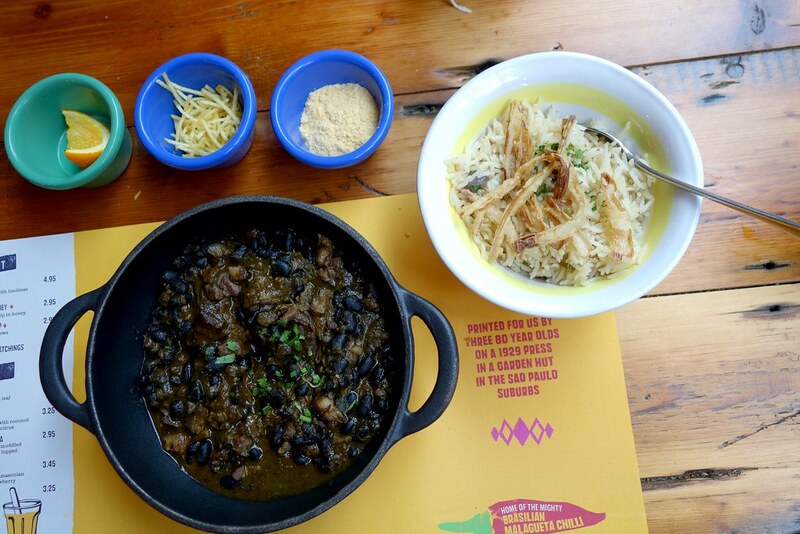 Everything was really tasty, and flavourful, although I do regret not going for the hot version of the Feijoada, as I absolutely love spicy food! 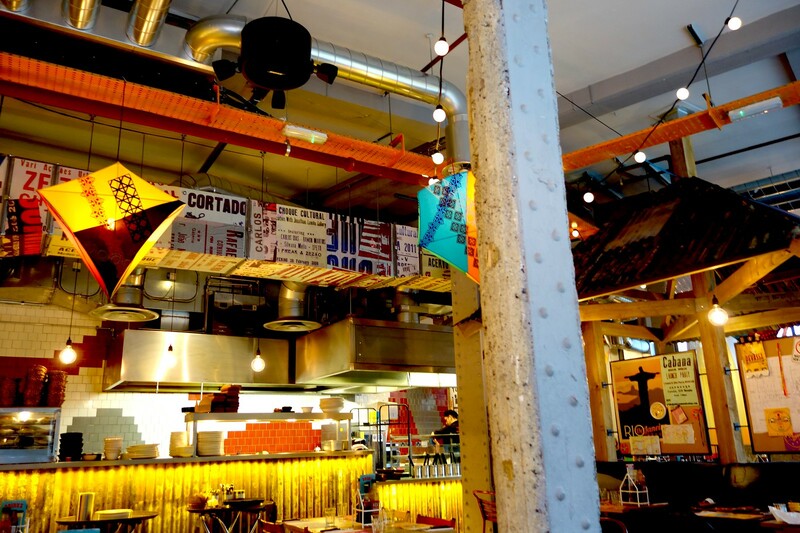 The staff were absolutely lovely, especially as we ended up in there for ages – we ate pretty slowly, and I tend to drink cocktails at a snail’s pace, but I didn’t feel rushed or hurried along during my time there, which was really nice. Although we were pretty stuffed at this point, I couldn’t resist trying their frozen yoghurt! 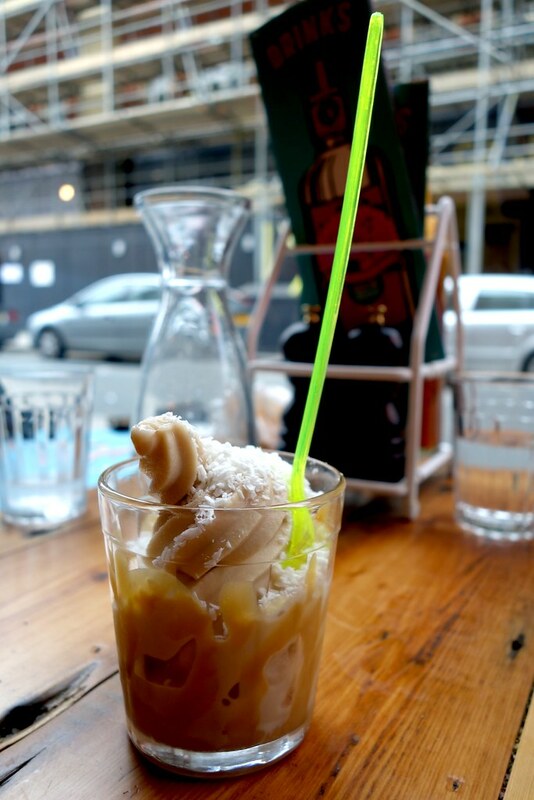 Unfortunately their peanut butter one, which I was hoping to try wasn’t working, but I had their caramel one topped with desiccated coconut and caramel sauce, which was delicious. 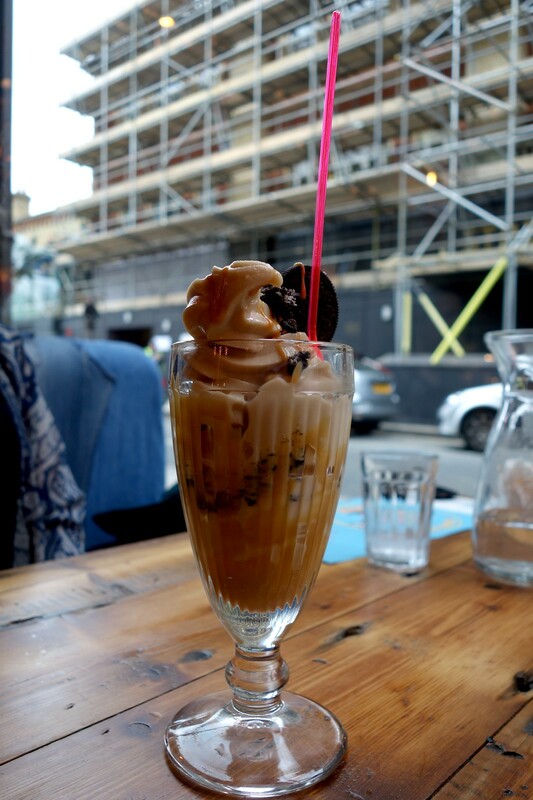 My friend went for the peanut butter and oreo sundae, which was pretty epic, although absolutely massive – she didn’t quite manage to finish it all after that meat! 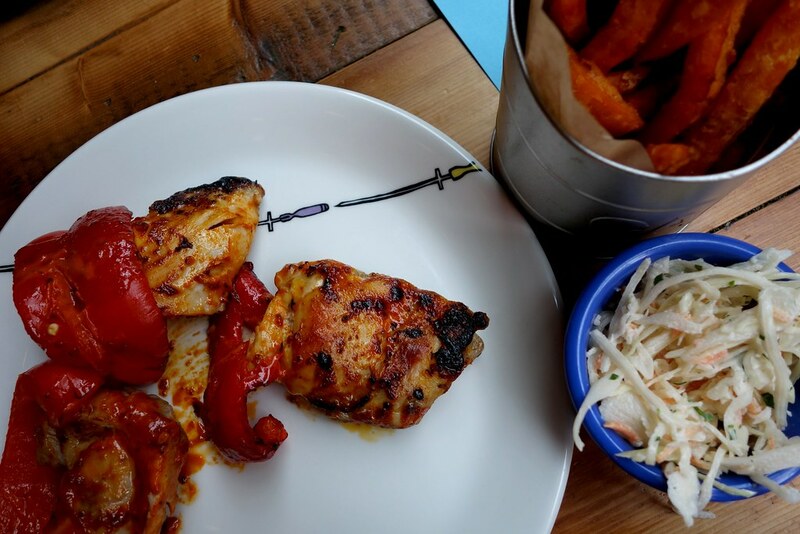 I really enjoyed my time at Cabana Brixton – if you’re in the mood for delicious cocktails and great food in a chilled out atmosphere! 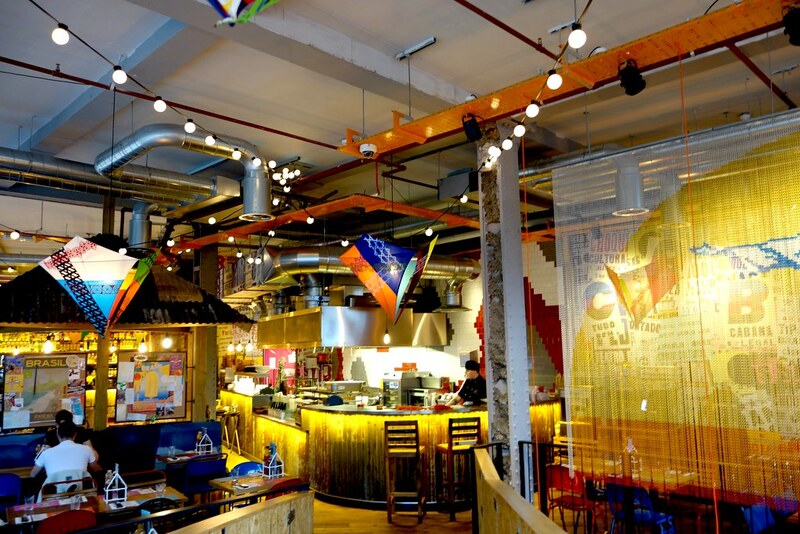 Have you tried any great Brasilian food in London lately? 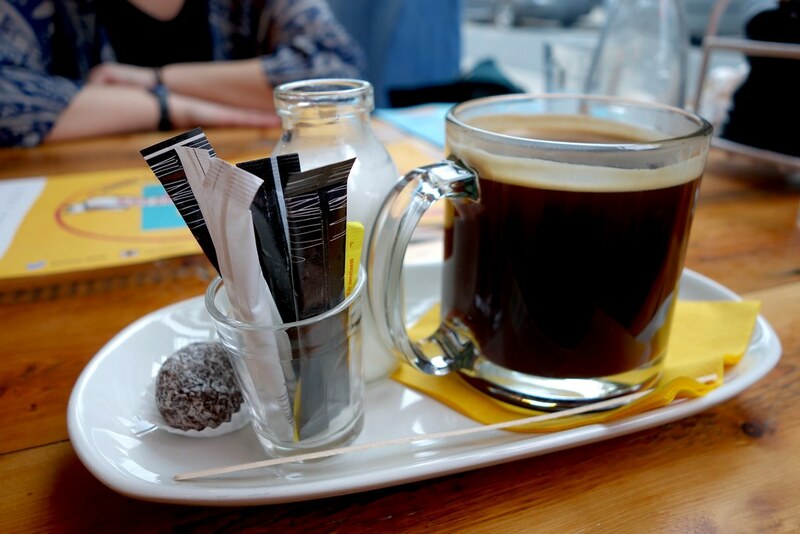 What are some of your favourite places? Be sure to comment below, or let me know on Twitter, Facebook or Instagram! 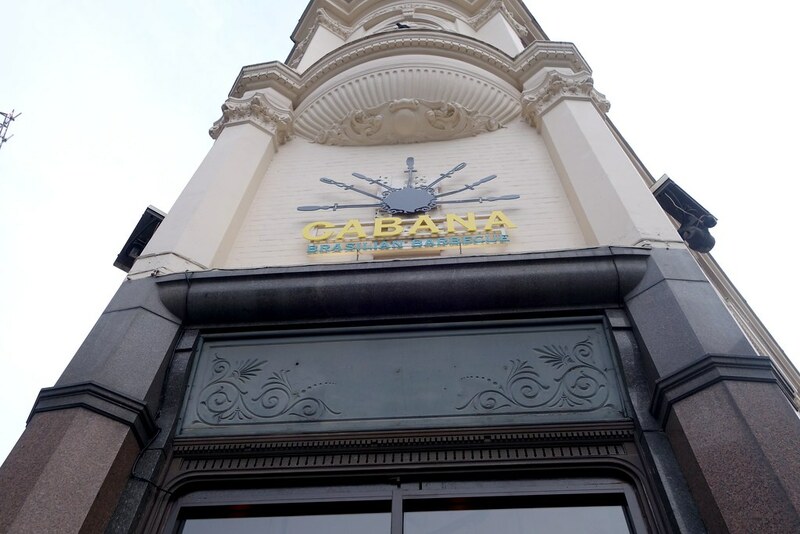 I was invited to Cabana Brixton for a fair and honest review – as always, if I didn’t love it, I wouldn’t blog about it! Yum! I’m going to Brazil later in the year, I can’t wait to try the authentic stuff!